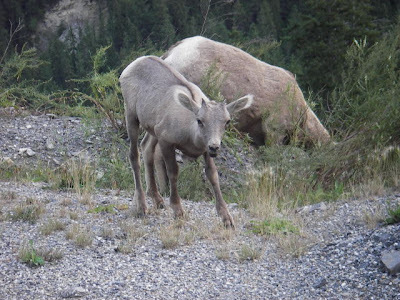 Since our last post, we headed north to the Clearwater River. On our first shuttle to the put in we pulled in to offer a ride to a needy paddler…turns out the paddler had another two in tow which where very old friends of Si, Stefan and Monica. Much to our delight in return of shuttling them back to their car they drove our shuttle for us. We ran all four sections of the Clearwater. 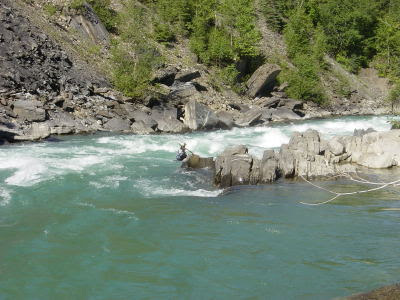 A classic river in northern BC providing large rapids, some good play waves like Tsunami and even a waterfall. With new friends in tow and use of their extremely good knowledge of BC. 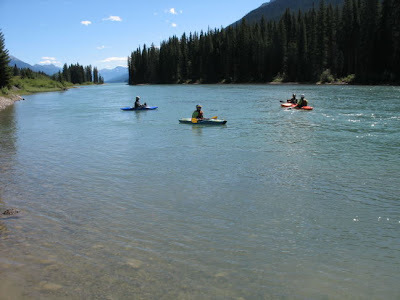 We embarked on a week long tour of rivers in BC and Alberta. The first was the Canoe river (If you ever go the guy at the Canoe river campground will run shuttle for you). Beautiful remote class 3 / 4 creek run. 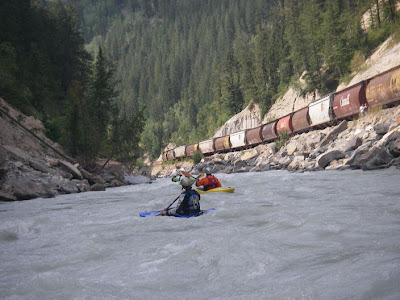 Onwards to the Fraser in the shadow of the beautiful Mt Robson…staying away from the rafting sections and paddling two upper sections. 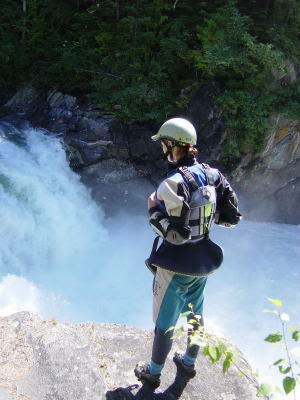 Although Cheryl had a fun time running one of the harder rapids Outhouse..shame the camera never caught the action. We paddled the same sections two days running. I have to note here we did indulge a little after paddling and hit the Fairmont hotel in Jasper for cool beers…Yummy. Starting our descent in to the Rocky mountains… we hit rocks literally. The Astoria, a class 3/4 low volume creek…well we had low volume and was more boat bashing than paddling. Probably our worst paddle of the trip although the scenery was beautiful. 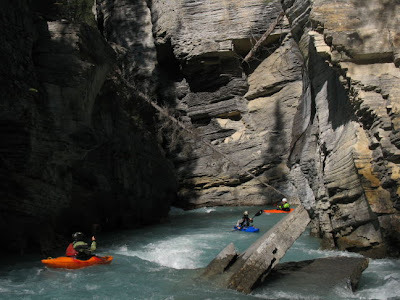 To make ourselves feel better we decided to go for a hike in with our Kayaks, the Mistaya Canyon. Probably the most beautiful paddle on our trip. 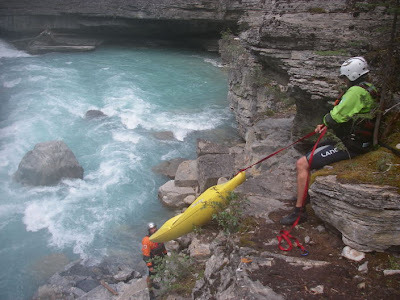 With a 150 m descent into the canyon we roped our boats in. 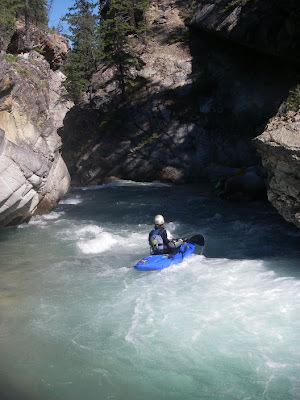 The paddle starts in a beautiful narrow canyon pool drop rapids opening up to a rock garden river with views of the surrounding rocky mountains. Following one of the most scenic drives through the Rocky Mountains along highway 93 and a quick stop off at the Columbia glacier (they drive buses on the glacier), we decided to run two sections of the kicking horse…sadly despite the big volume of water, the spring floods have washed out most of the class 4 rapids if not all of them on the lower Canyon section. While we had a great time on the both we all felt a little under whelmed. Next was Bobby Burns…we would have paddled it if we found the put in… after 3 hours of driving, 7 trees cut down off the road and 1 flat we give up hope and turned around. 2nd choice was Bugaboo but it turned out to be too low… our first day of non paddling in a while…so we spoilt ourselves with a beautiful campsite next to a lake. 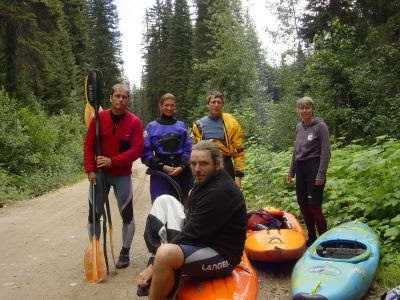 Our final BC paddle and with our friends Stefan, Monica and Christophe was the Horse thief creek.. a remote paddle as per BC style up miles of logging roads. A nice long creeky river to end our days in BC. We have to say a special thanks to Stefan, Monica and Christophe who on their turns to cook fed us both like Kings, who showed us down rivers we wouldn’t have thought about, provided a second shuttle vehicle saving us and Christophe from mountain bike hell and most of all were just great company. 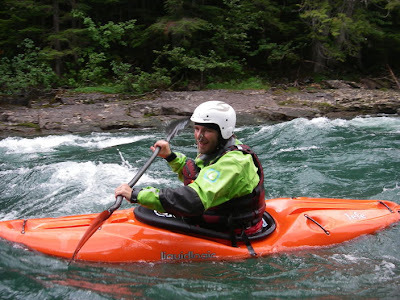 We have finally posted up some BC shots both kayaking and Scenery (in separate folders) on webshots… see our pictures link on the right hand side.